Set inside the offices of the Nation Building Authority, a federal government organisation responsible for overseeing major infrastructure projects, Utopia explores that moment when bureaucracy and grand dreams collide. Its a tribute to those political leaders who have somehow managed to take a long-term vision and use it for short-term gain. The award winning series follows the working lives of a tight-knit team in charge of guiding big construction schemes from announcement to unveiling. Constant shifts in priorities are the order of the day as the staff are asked to come up with plans for everything from new roads and rail lines to airports and high rise urban developments. In short, Utopia examines the forces that go into creating a very well-designed white elephant. Featuring a stellar comic cast led by Rob Sitch, along with Celia Pacquola, Dave Lawson, Dilruk Jayasinha, Kitty Flanagan, Anthony Lehmann, Emma-Louise Wilson, Nina Oyama, Rebecca Massey, Jamie Robertson and Toby Truslove, Utopia is a comedy for anyone who has ever been crushed by the bureaucratic process and lived to laugh at the memory. 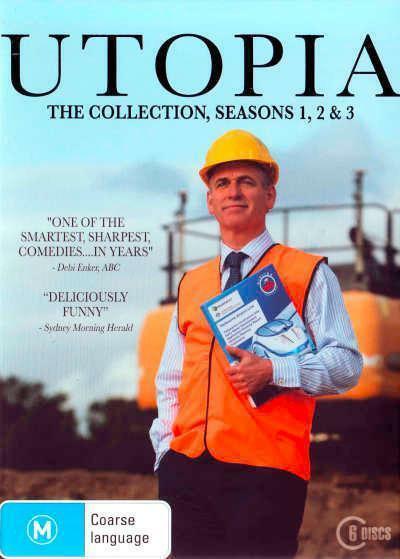 Utopia is written and produced by the award-winning team of Santo Cilauro, Tom Gleisner and Rob Sitch. Michael Hirsh is Executive Producer. Original Casting by Jane Kennedy. Series Casting by Kate Leonard. The series is directed by Rob Sitch.